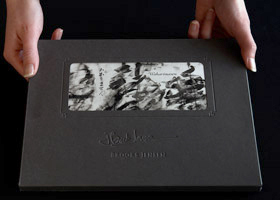 Brooks Jensen Arts - What is a folio? Well, I have to confess I'm redefining the term a bit by adapting a bit from all these ideas. Years ago, I took a couple classes in handmade artist's books to try to find a way to use gelatin silver prints in a bound book. I read books, asked talented book binders, consulted with fine art book binders. I never did find a usable format that was practical. I even visited the Center for Photography in Tucson to see the artist's books with photographs in their special collection. I've seen lots of types of binding and materials, but most of the ones I've seen were literally falling apart from the stress on the bindings or far too expensive to be used in an edition-type production. After searching for years, I finally just threw in the towel on the whole idea of binding and settled on the advantages of loose sheets. I especially warmed to the idea when I realized that this method gave people the option of viewing the prints either as hand-held objects, or they could mat or frame them if they chose to. To me, a "folio" is a collection of loose, unbound prints defining a content that is more like a book than a random stack of unsequenced prints. In my folios, I use a title page to lead things off, then typically a statement about the project, the images pages come next, sometimes an afterword is appropriate, and the last page is a colophon. They are sequenced, like a book, but loose, like a portfolio. It's my answer to the problem of how to include original prints in a book without doing tip-ins. I can do this type of presentation with gelatin silver prints, photogravures, inkjet prints — literally any flat sheet or image. I can include a sewn text signature or French fold component. I can even include a CD if it's called for in the project. It's turned out to be quite a flexible design idea that allows all kinds of individual adaptations. I'm currently using a folio cover that is die-cut with a hole that allows me to place a title page behind the cover, showing through. This allows me to produce a large quantity of covers (amortizing the costs involved), and make folios for any project from one copy to hundreds. Again, flexibility is the key to the design. I've never actually seen anything quite like the folios I produce, so there really isn't a term for it. I've been forced to make my own definition. I even tried to find a Latin root that I could adapt, but folio seemed the best, so that's the word I use. I've used this term since 1992 when I made the original Made of Steel folio. The cover is made from an acid-free archival art paper. My favorite that I use time and time again is Gilbert Oxford in the heaviest 100# Cover. It comes in a variety of very rich and perfect colors. The assembly uses only archival, acid-free materials to protect the life of the prints and pages inside. 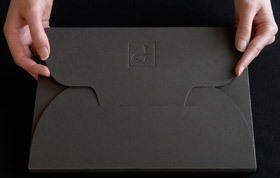 Each folio is shipped in a sealed, plastic sleeve. 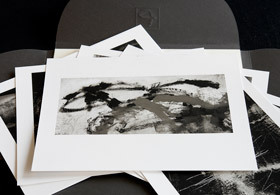 Folios are numbered by printing edition - a description of this numbering can be found here. I sign the title page and hand-number the colophon. 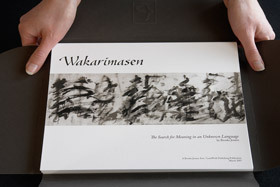 There is a short video of the Wakarimasen folio on this page.